Pseudoscorpions (commonly known as False Scorpions) represent one of the most under-recorded and infrequently studied of all our invertebrates. Many naturalists have never seen one, despite several species being classed as common and we have failed to find them for ourselves on many occasions. It seems that the best way of finding Pseudoscorpions, is by making specifically targeted searches in the correct habitat. But finding good, reliable information about them on the internet, is still disappointingly difficult. 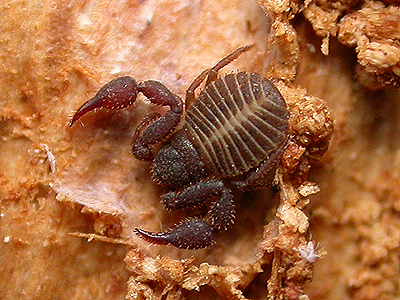 Pseudoscorpions inhabit a variety of habitats, from coastal strandlines to leaf litter on forest floors and from old bird nests to houses. They are extremely difficult to identify, which may obviously put many people off recording them. The UK has 27 known species of Pseudoscorpions, of which 13 are currently known from Nottinghamshire (VC56). Below is the Pseudoscorpion Chernes cimicoides and its habitat at Sherwood Forest Country Park. 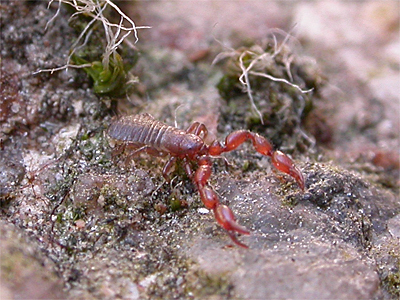 Pseudoscorpions can be found in a wide variety of habitats, including gardens. In the 1980's, we used to find them regularly in old, rotting leaf mould at the Arboretum Park in the centre of Nottingham, although we have no idea of the species. The purpose of this page is to provide a general introduction, create awareness of, and to summarise Nottinghamshire's known Pseudoscorpion records from the past 50 or so years to a wider readership. We have avoided the use of common names, as to be honest, they are as difficult to remember as the scientific names. Trying to research the status of Pseudoscorpions in Nottinghamshire, once again relied upon the work of J.W. Carr's book "The Invertebrate Fauna of Nottinghamshire" published a century ago, with more up to date information coming via the National Pseudoscorpion Recording Scheme of the UK and the NBN Gateway. In September 2015, additional information regarding Nottinghamshire records of Lamprochernes chyzeri, Pselaphochernes dubius and Roncus lubricus were provided by Liam Andrews, bringing the Nottinghamshire list to 13 species, although we believe that one may be suspect. This still means that there is considerable opportunity for new county records to be discovered, or even a species completely new to the UK is not totally out of the question. There are no historical records, the first Nottinghamshire record being from The Ropewalk in Southwell in 1962, where it was also recorded the following year. There were no further records until it was recorded from Newark in 1977, followed quickly by two Sherwood Forest records in 1978. Nottinghamshire's most recent records are from Attenborough (Sexton, T.) in 2015, Lambley (Pendleton, T.A. and Pendleton, D.T.) in early 2016 and from Nottingham Trent University's Brackenhurst Campus and a further site in nearby Southwell (Andrews, L.) in 2016. Historically only one record from 1906. In Nottinghamshire, this Pseudoscorpion is known only from Sherwood Forest, where it was first recorded in 1978 (on four dates) then a record rather vaguely dated as before 2002. The most recent records came in 2016 (Pendleton, T.A. and Pendleton, D.T. ), when it was recorded on three dates in May. Chernes cimicoides is the most regularly recorded species, with well over 30 records found. Most refer to the Sherwood Forest area. Historical records come from Colwick Woods and Sherwood Forest dating to 1906. During the 1960's, it was frequently recorded from Sherwood Forest in 1963, 1965 and 1969. It appears to have been just as well recorded in the 1970's, with a Sherwood Forest record dated as 1973 (two records) and another in 1977. Surveys of the Sherwood Forest area conducted by a British Arachnological Survey team, recorded C. cimicoides nine times during 1978, then a further four times in 1979 and there is a record from Mansfield in 1985. 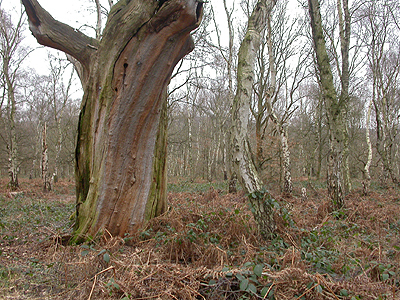 In 2002, another Sherwood Forest survey produced three more records and it was recorded there several times in 2016. There have been recent records from Nottingham Trent University's Brackenhurst Campus (Andrews, L.) in both 2015 and 2016 and from Attenborough NR (Sexton, T.) in 2016. Known only from the Sherwood Forest area. There are historical records dating from 1905, 1906 and 1912, but no further records until recorded in 1976 and eight times in 1978, during surveys of the Sherwood Forest area conducted by a British Arachnological Survey team. The most recent records were again from Sherwood Forest Country Park in 1985 and the Buck Gates area in 2009 (Alexander, K.N.A. 2009). There are currently four records of Lamprochernes chyzeri from Nottinghamshire. It was first recorded from a house at Nuthall in 1977, followed several years later by two Clumber Park records - from Thorney Hill in 1984 and Paddock Wood in 2004. In 2013, a Pseudoscorpion we had taken from under Oak bark at Sherwood Forest CP, was re-identified as being L. chyzeri when examined again in 2015. There are just six Nottinghamshire records, including one which is historical. These are from Worksop in 1903, Clumber Park in 1955, Sherwood Forest in 1969, Scrooby in 1973, Clayworth in 1975 and more recently from a manure heap at Tug Bridge Farm near Eakring (Pendleton, T.A. and Pendleton, D.T.) in 2015. There are currently just a handful of county records, including Owday Pond near Worksop in 1998 and again 2002, and Sherwood Forest on two occasions in 2002. There are three records of Pselaphochernes dubius held by the UK Pseudoscorpion Recording Scheme, but the status of this Pseudoscorpion as to ever having occurred in Nottinghamshire at all is unclear. We have provided a distribution map in our recent Pseudoscorpion atlas (see link at the bottom of this page), based on two records which probably refer to the same record, dated Sherwood Forest on 19/09/1978 and listed on the NBN Gateway, and a 1978-1979 Sherwood Forest record at SK620683, listed in the 2005 Invertebrate Site Register by Natural England East Midlands. But after having had first hand access to copies of the 1978-1979 British Arachnological Society's Sherwood Forest Country Park Arachnid survey report and the later 2002 Arachnid survey by Denton, Green, Legg, Hemingway, Marsh and Sharp, we felt it strange that no mention of the record was made. 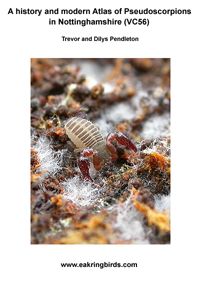 Neither report mentions any record of Pselaphochernes dubius and the 2002 report even provided some summarisation of all the known Sherwood Forest Pseudoscorpion records. The NBN Gateway also lists a 1906 record for Sherwood Forest, yet the given grid reference of SK600600 puts the record directly on the site of the former Rufford Colliery at Rainworth, although the Colliery was not sunk until 1911. To add to the confusion , Carr does not list any record of Pselaphochernes dubius in his book, or in the later published supplement to his original volume. There appeared to be no post-2000 Nottinghamshire records until Chthonius ischnocheles was recorded at Attenborough NR in 2015. Historically, it has occurred at Rampton, Mansfield Woodhouse, Mansfield, Pleasley Vale, Creswell Crags Quarry, near Bulwell Wood Hall and at Mapperley Nottingham, Sherwood Forest and Colwick Woods between 1903 and 1906. Other previous records include Crew Lane at Southwell in 1963, several records from Sherwood Forest in 1969 and Sherwood Forest again in 1979. In the 1990's, it was found at several sites near Worksop, but Nottinghamshire's most recent records have come from Nottingham Trent University's Brackenhurst Campus at Southwell, Attenborough NR and Carlton Wood near Worksop. Considered by some to be a form of Chthonius tetrachelatus, there is a single 1971 record from the Idle Valley (Howes, C.A. per Andrews, L.) found in pond weed dredged out of a dyke and which had been left to rot. As far as we are aware, this Pseudoscorpion has only been recorded once in the county since historical records from Bulwell Hall Wood, Grives Wood near Kirkby-in-Asfield and Mansfield Woodhouse in 1903. The most recent record came in 2003, when Chthonius tetrachelatus was recorded from Walkeringham NR, in the north of Nottinghamshire (Williams, H.). Three historical records from Sherwood Forest in 1912 (twice) and another from Bramcote in 1916. The most recent (accurate) records seem to be from Clumber Park in 1964, Birklands (Sherwood Forest) in 1979, Owday Pond near Worksop in 1998 and again in 2002, Carlton Wood from 1999 to 2001, then Ash Tree Hill Wood in Clumber Park in 2004 and Oblong Clump in Clumber Park (Binding, A.) in 2005. The county's most recent records are from Attenborough NR and Nottingham Trent University's Brackenhurst Campus at Southwell. An elusive species, usually found in leaf litter and moss. There are currently only two county records. These are from Nottingham Trent University's Brackenhurst Campus at Southwell on 04/10/15 (Andrews, L.) and one at Coppice Park in Nottingham on 28/12/15 (Skinner, M. and Heeney, W.). The following list of records, does not include any historical records given by Carrs original book published in 1916, or the later supplement he produced in 1935. Post-1950 records have been sourced direct from individuals, or the original survey reports produced by the British Arachnological Society, Entotax consultancy (on behalf of English Nature) and Keith Alexander (on behalf of Natural England) and the NBN Gateway. Rejected records are highlighted in yellow. The list includes all records we received for 2016 and our own 2017 records. ................................. . ................. ................. ..................................... .
Chernes cimicoides Rainworth SK600600 01/04/1973 UK Pseudoscorpion Scheme Grid ref is near RainworthReject record. Chernes cimicoides Proteus Square SK639693 01/01/2002 Natural England Duplicate from 2002 Entotax survey. Chernes cimicoides Sherwood Forest SK620683 01/01/2002 Natural England Duplicate from 2002 Entotax survey. Lamprochernes savignyi Sherwood Forest SK624676 2002 UK Pseudoscorpion Scheme Duplicate from 2002 Entotax survey. Pseudoscorpions (more commonly known as False Scorpions) represent one of the most under-recorded and infrequently studied of all our invertebrates. Many naturalists have never seen one, despite the fact that several species are described as being common and finding good, reliable information about the UK's 27 known species on the internet, is still disappointingly difficult. This publication, brings all Nottinghamshire's post-1950 Pseudoscorpion records together into a single document (but does not include the 1971 record of C. kewi) and aims to produce an accurate picture of their current distribution in VC56, including species distribution maps and a 'clean up' of all records listed on the NBN Gateway.